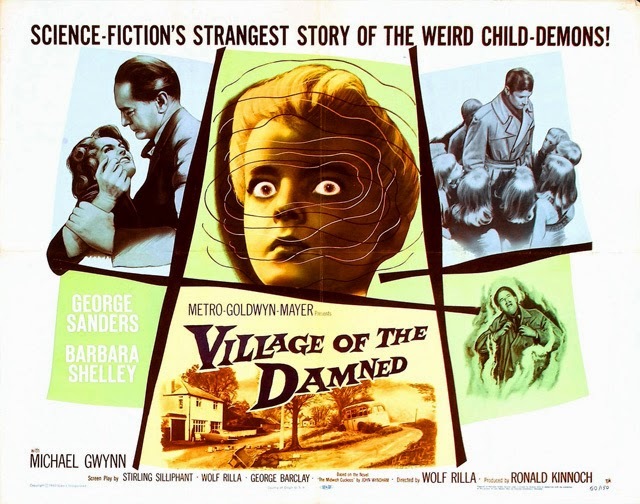 Classic Sci-Fi: VILLAGE OF THE DAMNED | Warped Factor - Words in the Key of Geek. At a time when science fiction films were being made mostly with bad scripts, bad actors and even worse production values, there were a handful of genre films that were the exact opposite. One of these was 1960's Village Of The Damned. Based on John Wyndham's novel The Midwich Cuckoos, this tale of a mysterious blacking out of an English village and the more mysterious children born in its wake has becoming something of a genre classic in the five decades since it was released. The reasons for this are not hard to see at all thanks to a fine combination of cast, direction, cinematography and script. In some respects a film is only as good as its cast and this film is certainly no exception. George Sanders gives a very believable performance as Professor Gordon Zellaby, the man who finds himself caught more and more in the heart of mysterious events. Barbara Shelly plays his wife Anthea, herself a mother of one of the mysterious children and who finds herself increasingly isolated from that child. Martin Stephens plays Barbara's brother Alan, a military man who stumbles across the mysterious events and becomes linked to it from that point on. Then there's members of the village such as Laurence Naismith as Doctor Willers, Bernard Archard as the local Vicar and others who find themselves baffled and increasingly alarmed by the events around them. Together these actors help to anchor this film with a sense of reality often lost in films of this genre, both then and now. No review of this film would be complete without mentioning the mysterious children of course. 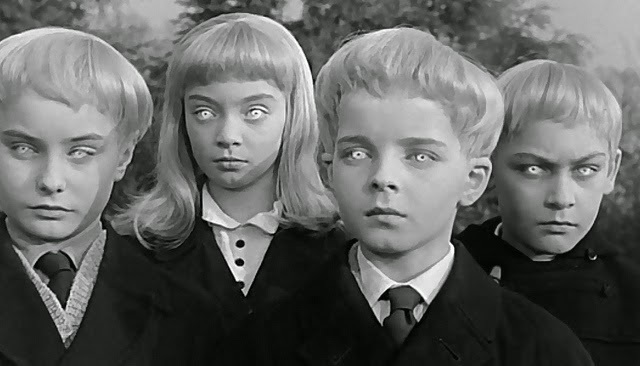 Led by child actor Martin Stephens as David, this group of children are amongst the most menacing and odd “monsters” to ever appear in a science fiction film. Notice I use monsters in quotation marks, would you? Yes they are children, but at a time when bug eyed monsters were all the rage, Wyndham's novel and the filmmakers took what should have been innocent and made it into a monster of sorts, driven by logic and the need to survive at all costs. With simple looks, coupled with a special effect that looks impressive even fifty years later, they become utterly believable as creatures of menace. The result makes the film all the better not just then, but now as well. Two more ingredients in the film's success are the direction and cinematography. Perhaps taking a cue from Val Guest's direction of the first two Quatermass films, Wolf Rilla choose to direct the film in a very low key way that avoids any of the showier techniques of the time except when its really needed, as in the climax of the film. This is coupled with the cinematography of Geoffrey Faithfull who shoots the film in a low key, almost pseudo-documentary style that is also very much akin to that seen in the first two Quatermass films. The result is a film that feels realistic even in light of its science fiction events. Which brings us to the script written by Stirling Silliphant, Wolf Rilla and George Barclay. Adapted from John Wyndham's novel The Midwich Cuckoos the script is a fine example of construction and dialogue being put together brilliantly. From the moment the entire population of the village of Midwich blacks out to the army's investigations of it, there's a mystery in place for the characters (and the viewer) to solve. It is only when the women of Midwich fall pregnant, their children are born and begin towards their appointed destiny that the mystery begins to unravel. As that happens, the film methodically builds in tensions right to the end. All the while though the script reminds us that these are ordinary people caught in the midst of increasingly mysterious events around them thanks both to character moments and the dialogue present throughout. The only really mixed element found in the film is its score by Ron Goodwin. Goodwin's score is very effective in places, especially in sequences where it is wonderfully timed to the special effect of the “looks” the children give. There are just as many other moments though where the music is utterly out of place, no more so then the heroic march played over the closing credit sequence for example. Consequently, the score ranges continuously between being highly effective or out of place to the point of clashing. 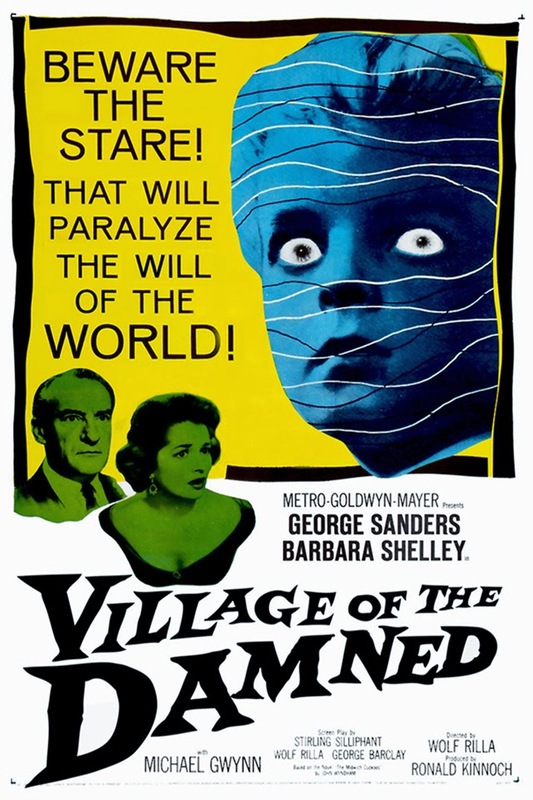 Village Of The Damned has become a classic of the science fiction genre all thanks to a fine combination of a great cast, Wolf Rilla's direction, Geoffrey Faithfull's cinematography and a fine script. By choosing to be the exact opposite of everything bad science fiction films of the time were, this film still has the power to be every bit as tense and mysterious as it ever has been. That's proved to be even more true some fifty-five years after its initial release.